It was late spring, 1960, and we moved from our smallholding to live with relatives whilst waiting to move into our new home. During the move, my father bought something which was to transform my immediate and long term interests. On the first evening after we'd moved, I noticed an old Honduras Mahogany case with a brass tubular folding handle on the table. My father indicated that it was for me and that I should have a look inside to see what it was. I remember that very first 'meeting' with the Watson microscope, and the general sense of awe that I'd got something rather classic and special has not faded from my memory. The rest is personal history of course, but the microscope he'd bought for me marked the beginning of a lifelong hobby, which at that time he couldn't have realised. 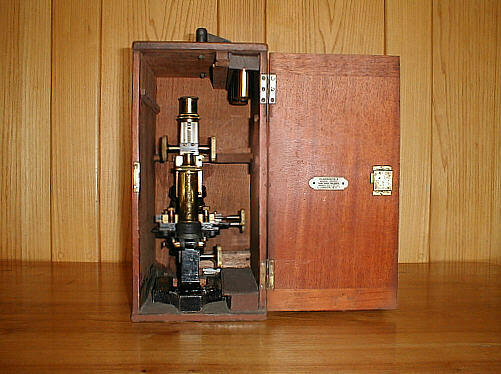 Changing from a 'toy' microscope with pinhole apertures etc., to a Watson monocular with all the accessories, was both a joy and a quantum leap for me. I seemed though to understand intuitively, its classic qualities, and the care required to use and respect its Victorian workmanship, yet learning so much so quickly whilst ogling at quality images I'd never believed possible. The stand is almost entirely brass, including the foot and limb, and is well engineered. I particularly like the dovetail slides and especially the milled slots that allow adjustment, and the beautifully designed and crafted finger controls. Also the mechanical stage, which I was soon to realise was a luxury at the time, had limited movements by today's standards, but sported simple and well positioned controls. The substage was well equipped, having a choice of two condensers, an Abbe, and the Watson Universal Achromatic 1.0 NA , the like of which is not seen as standard kit on many modern day stands. Facilitation of alignment of the whole optical system was standard practice in those days, which I think is a sad omission on some modern stands........The mirror, though showing signs of aging silver, is still perfectly usable. Original brass objectives plus a couple of purchases in later years. 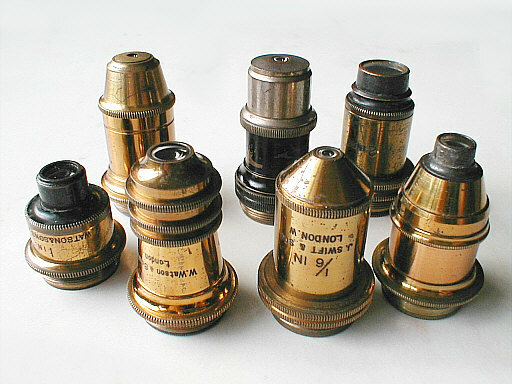 The 5 achromatic objectives, 2", 1", 1/2", 1/4" and a 1/6", each with its own brass screw top 'can', were a mixture of the maker's, and some 'no name' objectives, plus two eyepieces, both Huygens. My favourite objective was the Watsons 'Parachromatic' 1/4" which had a large NA of 0.68, which is on the high side by modern standards, and was a work of mechanical and optic art. There was no oil immersion lens, which was just as well I think in retrospect, for this requires delicate handling and some understanding in use, and could easily have been damaged by a young person. For practical reasons I replaced its original two objective turret holder with a triple mount, which is the only alteration it's received. The original I still have. 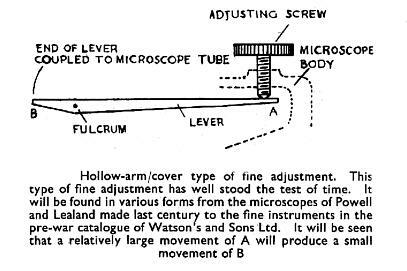 One of the many features I like about this microscope is the fine focussing mechanism, being an excellent example of the screw lever principle. It carries its movement through a dovetail slide, immediately behind that of the coarse focus. It looks dated of course, but simple ideas well executed are a treat to use, and it has a little feature worth describing for those who have not seen this before. The top and lower knurled extremities of the fine control offer different 'feels' to the microscopist. 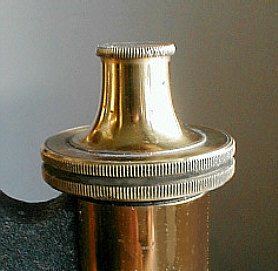 The upper part, being quite narrow can be spun around rapidly, and with the help of the 'flywheel effect' at the lower end can traverse the whole range of fine focus in two or three seconds if need be, and is especially useful when observing thick specimens, passing through the multiple planes of focus very rapidly, which is not possible with modern mechanisms. This particular feature was a great advantage when observing living specimens in water as the creature could be 'followed' in the vertical plane with consumate ease, and I dearly miss that convenience. The wider lower rim offers more critical adjustment for the higher powers. It is simple, utterly reliable and very sensitive too. 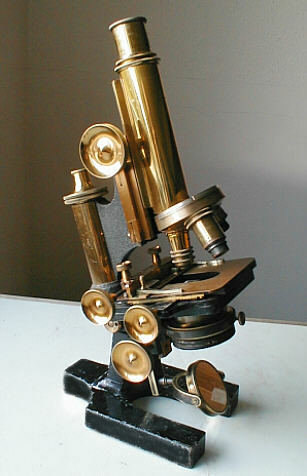 The microscope came with many interesting sundries, including Nicol prisms, (Iceland spar crystals) for polarizing work , each held in cork , and housed in a rotating brass body, a low power silvered vertical illuminator, and a divergent or bi-concave optic in a brass mount with RMS thread which attached to the bottom of the draw tube to increase the image scale. All in all enough to keep a 16 yr old amused for a very long time ! Much needed information at the time was absorbed from many books by Conrad Beck, Hinds, Barnard, Hall, Miller, Malies etc., and as my skills with substage illumination grew, my slide collection expanded in greater proportion! One day my good neighbour brought in several boxes of Victorian slides, bought at auction, their date of preparation ranging from 1862 to about 1920? plus two boxes of pathological slides from a later period. Thus I'd started in a time warp, and remained so, often looking at bits of the real world too! Wallowing in the mechanical engineering and optical excellence of a period now gone, and peeping at aging slides lovingly prepared by both amateur and professional alike. My old Watson with its pedigree stable of mechanical and optical engineering are old friends now, and in fact this year we are celebrating 40 years of partnership! Not surprisingly, we have been together through thick and thin, the 'scope enduring periods of enforced loneliness in the cabinet, and also periods of frantic use, altogether longer than my marriage to my dear wife in fact! I now have a Wild M20 (binocular), to help keep my eyes happy and healthy, but my Watson is not envious, she goes back into her cabinet knowing that she's a graceful old lady not that far off her 100th birthday, and that she'll be taken out now and again to be used occasionally too. 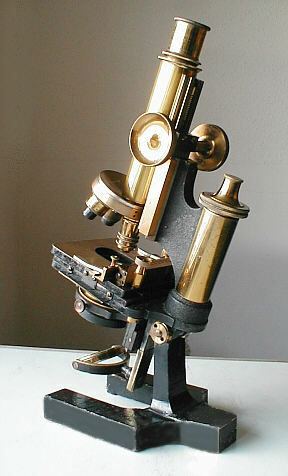 I would like to think that someone else will have all the fun and education that I had from this rather charming microscope in another one hundred years, and have their imagination expanded considerably as I had, by the awesome diversity of microscopic life. Comments welcomed to Paul James.